Headlines Fishing has been very good despite some rougher weather. Lakes have been fishing very well with all methods and the rivers have been very consistent. The Snowy Mountains Trout Festival is well and truly under way with some fantastic fish being caught. Check out www.troutfestival.com to see the daily results from the various weigh stations. The competition runs all through until Friday with some great prizes up for grabs. Rivers:- Have been fishing very well with some nice rainbows in the larger rivers and some great browns of all sizes in both the larger and smaller streams. Nymphs are still going to catch plenty of fish too, but there is nothing like seeing a fish rise to the surface to take your offering. If the weather is warm then evening rises are on the cards. Rain has had water levels fluctuating over the past week but there has still been some good rainbows being caught in the larger streams and a few browns too. The Eastern streams are still worth a look now before they get too hot in the coming months. 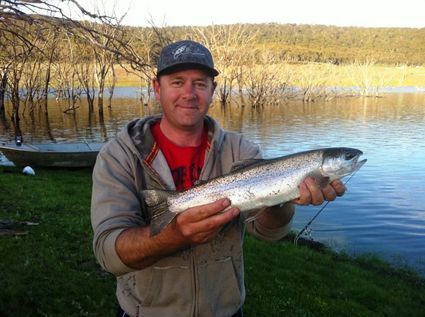 Lake Eucumbene:- Has continued to fish well overall. Weather has played a huge part in the action on the day though. There have been some good eveing rises and also enough fish to be caught just searching though the day. Water level has continued to rise though only slowly. The next three weeks may see the best of the fishing depending on what happens with the water level. *Had a couple of sesssions on the lake last week with the first night producing five rainbows and the next two. Mick Patton got six fish also on the first night and Mick Couvee three on the second. 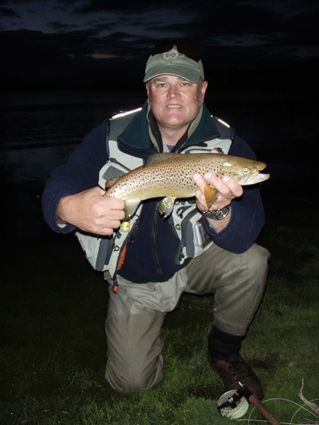 Mick Couvee is pictured below with a very nice brown caught right on dark when they were rising in close. Some more video footage from last weeks sessions to have a look at here. 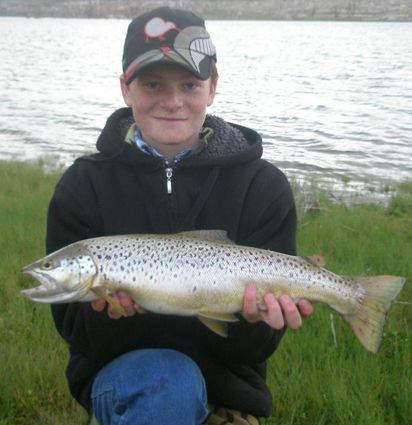 *Lachlan Sturgeon with a very nice fly caught brown taken last week. 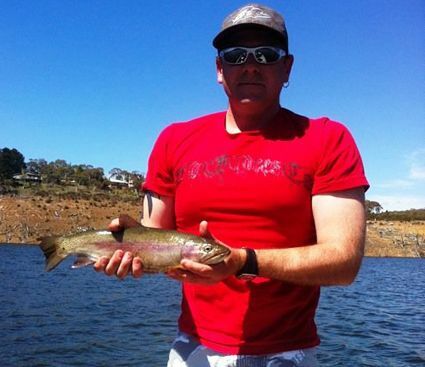 Lake Tantangara :- A few very nice quality fish have been reported but not much in the way of numbers at this stage. 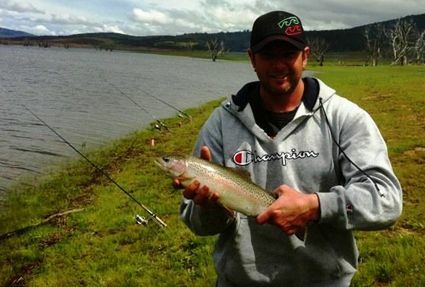 Eucumbene:- Eucumbene trolling reports have been excellent with plenty of nice rainbows being caught. Just returned from 2 weeks at Crow's 16-39th Oct. Probably 200+ fish(60 on troll balance on bait) between my brother and myself. Trolling was good to start with mainly on Tassies,anything with silver seemed to work with a very long drop back 100metres plus and dropped of the second week. Bank fishing was crazy ,used powerbait(chunky cheese),grubs,mudeyes and worms with the powerbait out fishing everything else,only 2 fish on mudeyes and about a dozen on worms.Most of the rainbows between 3/4 kilo to 1kilo and only 1 brown from the bank. Up to Anglers Reach Caravan Park for a quick fish. Hired a boat from Joyce and hooked a nice 2lb Rainbow 150m from where we took off from. Another small Rainbow followed an hour or so later then we headed for a grassy bank for some mudeye and powerbait fishing where we managed to land another 4 quality fish. Cleaned 2 of them and baked them in foil over the coals ( delicious). Saturday morning picked up another 2 Rainbows on Tassies then headed back to the bank and got another 8 fish. Flying back to Melbourne with frozen fish in our suitcase. Anglers Reach area has been good with some excellent quality browns. Jindabyne:- Trolling the edges has been o.k. but reports have been few and far between. Hope to get a few more over the next week or so. 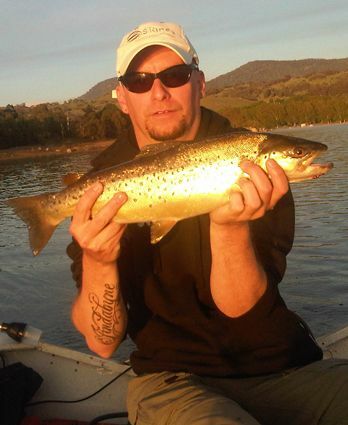 Here is a photo of a nice brown my mate Craig from Adelaide caught on a Freddo tassie in close. Just one keeper last Thursday on chunky cheese Gulp. Got dusted 3 times on bardi grubs, spewing. Persevered with the fly all night, got one whack on a mrs simpson around 11 but that was it.